Tag Archive | "Grindal Worm (enchytraeus Buchholzi)"
Grindal Worm (enchytraeus Buchholzi) are small white non parasitic worms that are closely related to earthworms and about one third the size of white worms. Smaller than white worms, grindal worms grow to a little over 1/4″ in length and have a nutritional value of about 70% protein and 14% fat, which makes them a valuable addition to an aquarium fish’s diet. Grindal Worms are hermaphroditic. When the worms mate with another individual to fertilize each other, they exchange sperm cells and during copulation, eggs are laid in transparent cocoons which contain approximately 20 to 30 eggs. As the density of the culture increases, the reproductive rate drops off, at which time the worms need to be harvested or transferred to a larger container. Many tropical fish keeping enthusiasts find Grindal Worms a great transition food for small tropical fish fry that require a lot of baby brine shrimp to get full, yet are too small to eat white worms. Culturing Grindal Worms is not difficult; just provide them a warm, moist medium, and food. Small plastic deli food or freezer containers about 4” X 4” X 2” tall, with a large hole punched through the lid for ventilation are fine for small batches. Put a small piece of filter floss into the hole to keep out mites and small insects. 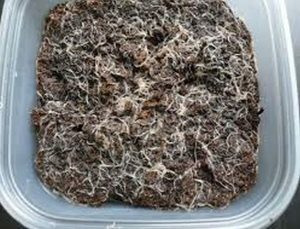 For the growing medium, you can use ground coconut fiber or mix equal amounts of potting soil and peat moss with enough water to create a thick, almost muddy, mix. If you squeeze a golf ball size of the mix in your hand and get a few drops of water from the ball, you have the correct amount of water for the medium. 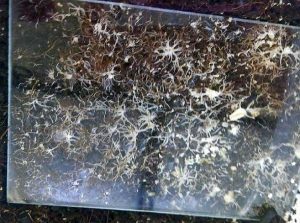 Spread a 1 inch layer of the growing medium on the bottom of the container, add the Grindal Worm starter culture along with some food, cover the medium with a small piece of glass, Plexiglas, or plastic cut from a container cover, and keep the container in a warm space. They multiply quickly at higher temperatures and reproduce best between 75-80°F. A “soil-less” method using two kitchen pot scrubbers can also be used in lieu of conventional medium. Place the scrubbers in the container and add enough water to cover the bottom scrubber and barely dampen the top pad. Add the culture, food, glass cover, and container cover. A Styrofoam tropical fish shipping container with a small modified aquarium heater can keep several cultures at the correct temperature, or you can just keep them on top of a warm aquarium hood. Regardless of which medium you choose, let the Grindal worm culture stand undisturbed for at least 7 days to allow them to propagate. Feeding the Grindal Worms is not a problem. Just sprinkle some ground up dry cat food, multi grain baby cereal, oatmeal, or fish food flakes over the medium, place a plastic cover over the food, and close the container cover. The worms will come to the surface of the medium to feed and congregate around the pieces of food under the plastic. As they reproduce and become thick enough, they can be harvested with a pair of tweezers or just scraped off the plastic cover into your aquarium. Harvest the worms before you feed them. Grindal Worm cultures occasionally develop mite infestations. If you spot teeny white or brown mites moving around on the surface of the culture medium, you have an infestation. Usually mites will not pose any problem, but if the population becomes too great, you may need to start another Grindal Worm culture. This is easily accomplished by collecting as many worms as possible from the top of the culture and placing them in a glass of water for about 10 to 20 minutes. The worms will sink to the bottom of the glass, and the mites can be carefully poured off with the water. Use the washed grindal worms to start another culture, or feed them to your fry. A Grindal Worm culture can produce worms for up to 6 months, but the medium will usually start to go bad after 4 months or so. Most tropical fish keeping enthusiasts keep at least 2 or 3 cultures on hand that have been started at different intervals. Label the start date on each container and begin new cultures as needed. Grindal worms cultures are readily available online from a variety of sources and are usually supplied with an information sheet, instructions for growing the worms, and even bags of growing medium. Substantial quantities can be grown in containers as small as a Deli container up to a shoe box.